The R2 line train service operates every day between Barcelona Airport and Barcelona Barcelona city centre every 30 minutes with a transfer time of around 25 minutes. A single ticket for this service costs 4,10 €. However, our advice would be to purchase a T-10 ticket (1 zone) for the duration of your stay in Barcelona. A T-10 ticket (1 zone) costs: 10,30 €. 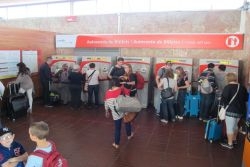 This is a multi-person travel card and allows you to use 10 journeys on any Barcelona public transport service. You can purchase the T-10 ticket at the automatic vending machines to be found on your right once you are in the airport train station. Moreover, the ticket would consider the Airport to Barcelona journey, as well as the transfer onto to the metro system to another destination as just one journey! Providing a transfer is made within an hour and 15 minutes, this is a feature of the T-10 ticket all over the Barcelona transport network, including FGC trains, buses and trams! 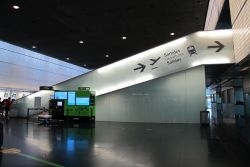 When you are travelling from the airport to Barcelona, you can get off of the train at Barcelona Sants Estació main train estation, Passeig de Gràcia or El Clot stations. All three of these stops are serviced by the highly efficient Barcelona metro system and from here you easily reach your final destination, wherever this may be in the city! 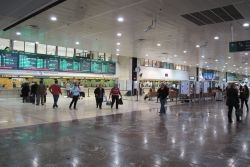 The regional train lines in Barcelona known as Rodalies, are operated by RENFE and will take you as well to various places in the metropolitan area of Barcelona and other towns in Catalonia. 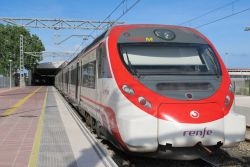 The entire RENFE network is wheelchair accessible. The train station at the airport is in front of T2. This Terminal is 4 kilometres apart from the T1 which you can reach with a free shuttle bus service if you arrive at T1. This shuttle bus will take you to the T2 and you will be able to distinguish them from other bus services by their colour (bright green) and name: Bus Transit/shuttle T1-T2. 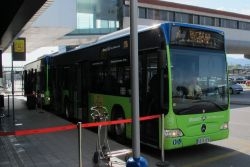 The shuttle bus stop at T1 is directly outside of the terminal building and stops directly in front of the T2 building as well. 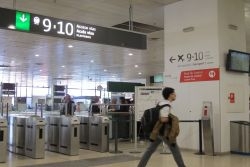 If you cannot find the signs for the stops, just ask at airport information, they will be happy to help you out! From 5:30 to 24:00: every 6-7 minutes. From 0:00 to 5:30: every 20-25 minutes. To get to the train station at Terminal 2 you have to go through the pedestrian walkway which you can access inside the Terminal 2.